Using Visuals to Reduce Confusion and Frustrations, and Encourage Independence. There are two sides to language. There is the understanding of what others say (receptive language) and there is what we say (expressive language). When an individual (particularly younger ones) with Autism Spectrum Disorder (ASD) or with certain other disabilities have difficulty understanding concepts which are abstract such as verbal speech, visual picture communication materials can help tremendously! A spoken word represents things that are abstract. While many people with certain disabilities may have difficulty (particularly at first) with what they hear, usually they have a much better understanding with what they see! We often see visual strategies such as picture symbols helping people to communicate both to represent their daily routines (receptive language), and/or to help them with the words they want to communicate (expressive language). Part 1: RECEPTIVE LANGUAGE Understanding Daily Routines Better With Picture Symbols: The Amazing Powers Of A Picture Schedule! Point to the pictures as you display them to the person, and tell them what they represent as you assist them with the routine. For example you may say: “FIRST we are going to wash up, THEN we can watch some TV.” This helps convey the ideas that they will be able to watch T.V., but that washing up does happen first. Anxiety is reduced as they realize they will eventual get to their desired activity (watching T.V.) after they go through the part they may not have been interested in performing (washing up). Like most new concepts, the ideas of a picture schedule do have to be taught, and the effectiveness of it should increase over time. It is a good idea to begin with more pleasant activities NEXT” display board. One schedule picture symbol item such as a “Wash Up” picture symbol is placed in the “FIRST” place area and the second picture scheduled item such as “T.V.” in the “THEN" spot. in a schedule so that the individual sees it as something in which theyare wanting to participate. For example perhaps use two desired items such as FIRST: “Fruit”, THEN: “Game”. As the idea of following the picture schedule become better understood, other ‘less desired’ daily routines can be added to the first location. IDEAS FOR DISPLAYING PICTURE SYMBOLS: Many different display options may be used, depending on the levels of understanding and abilities of the users. 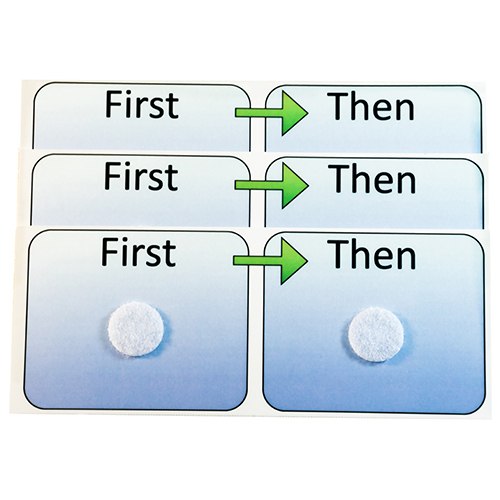 Picture Cards that are laminated will stand up best to repeated use. A dot of velcro on the back of the picture card with the receiving dot on the display board tends to be the most common display method. Velcroed symbols can be rearranged as needed and also removed after the task is completed. Other ways to display the schedule may be to lightly tape the cards onto the holding areas or using clear vinyl display pockets to arrange the sequence for common routines that do not change much. It is useful to remove or have a cross off/check off aspect in a picture schedule. This can bring an added benefit to the user of a feeling of accomplishment and it sets up clarity for what is next in the schedule. something else can decrease. Schedules can be helpful both at home and at school, and the collaborative use in both environments can reinforce the effectiveness of this type of visual strategy system. Not only can a visual picture schedule help someone understand what is expected in their day right now, it can also lead to the skill of better understanding of more detailed or difficult situations that may come to them in the future! About The Author: Don D'Amore M.A. CCC-SLP is a Speech Language Pathologist Certified by the American Speech Language and Hearing Association (ASHA), He has over 20 years of extensive experience working with Augmentative/Alternative Communication (AAC) and with communication strategies for individuals with Autism Spectrum Disorder (ASD). He has worked for a large urban school district as a district-wide SLP specialist for AAC for most of his career, and he also has worked part-time as an SLP for adult community homes for over 25 years. Don D'Amore has presented regularly for over 20 years at speech language pathology conferences and at other SLP and educator gatherings. For more than 12 years Don D’Amore has been the author and illustrator of all educational materials produced by SpeechPage.com Publishing Company. In 2009 Don D'Amore was chosen to be the recipient of the annual Award: "Honors Of The Ohio School Speech Pathology Educational Audiology Coalition”.